Most home fires happen in the kitchen, so you better be prepared in case of emergency. 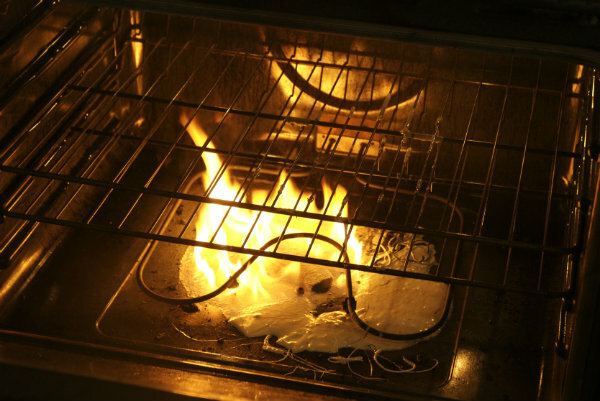 Oven fires are scary, but usually can be contained and often be easily prevented. Step 1 may seem counter-intuitive, but opening the door will only cause the fire to expand. By keeping the door closed and turning off the heat, you are starving the fire, since it can’t burn without oxygen. Open the oven door only when you are sure the fire is out. Put a cover on food that might splatter. When roasting, carefully drain some of the hot grease by removing the pan from the oven every half-hour or so. ServiceMaster DAK fire damage restoration specialists are ready to handle emergencies in the North Shore and Northwest Chicagoland suburbs 24/7, helping to restore your life to normal as soon as possible. Call us anytime at 847-564-0204!